This high quality eyepiece features a 6-element design that offers superior sharpness. All air to glass surfaces have a multi-layer coating (so these are fully multi-coated, even though the barrel imprint may say "multi coated") for maximum light transmission. The long eye relief allows for a comfortable viewing distance. All lens edges are blackened for superior contrast. 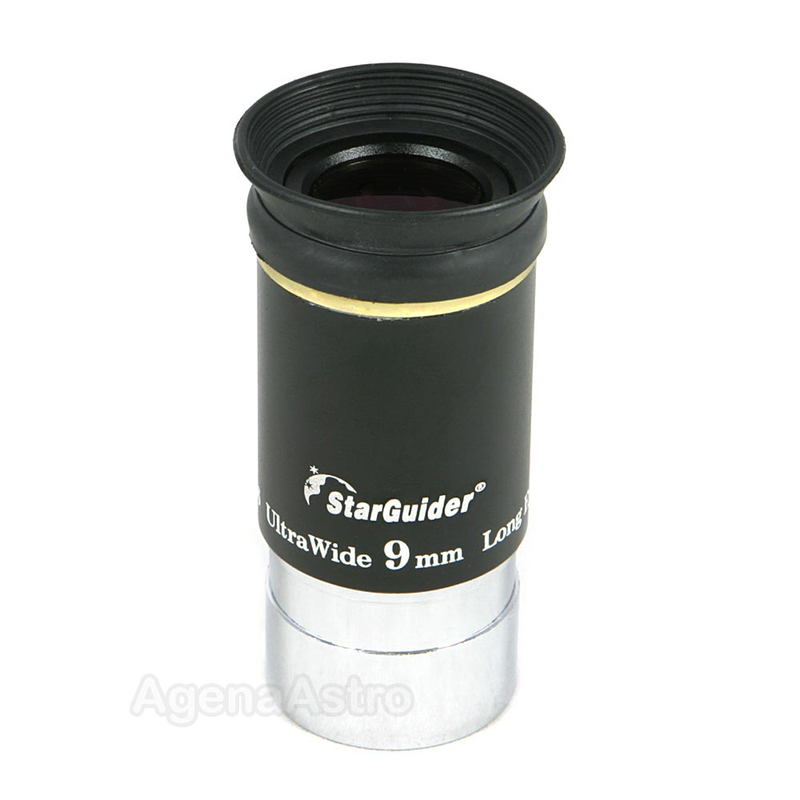 The insert tube is smooth-sided and is threaded for standard 1.25" astronomy filters. Order one today to start enjoying wide and comfortable high-power views of Saturn’s Rings, Jupiter’s Bands, icecaps on Mars, and more! The generous field of view of this eyepiece also allows for wide views of the Moon and deep-sky objects at moderate to high magnification. 4.6 (Based on 31 Reviews) 97% of reviewers recommended this product. This is really an excellent eyepiece and a great value, and I ended up buying the full set of these to be used mainly with my Maksutov-Cassegrain. Very sharp with little if any color aberrations. Great FOV compared with similar focal length Plössl's and comfortable eye relief. Weight is nicely balanced between heft and durability, and lightness to not load down the scope or add weight to your travel rig. Workmanship conveys quality. Highly recommended series if you want a nice portable set of eyepieces that span an essential range of focal lengths and give excellent performance. I was really, really surprised to see how well they packed the eyepiece. With free shipping, I expected much less. They had the eyepiece in its little box and then placed that inside of a tough little corrugated cardboard box and filled it to the brim with packing peanuts! I used it shortly after I got it and was very happy with it again. Curvature of field was very minimal on my 10-inch SCT. Even did a star timing and found that it came out to have a true field of view of 14.5 arc-seconds (which was even a little more than I had previously calculated!). Looked at M42 (the Orion Nebula) and was just taken back at how much detail I could see but still with so much of its size! Probably couldn't get a better eyepiece for an extra hundred bucks. Thanks guys. 5.0 My new workhorse eyepiece! Tested this 9mm on 3 instruments: an Orion 90mm Mak, a Celestron 90mm refractor, and an Omni XLT 150 newt. This eyepiece delivered amazing views of whatever we pointed at, and was the clear winner across all focal ratios! Crisp all the way to the edge of the field in both 90s, and Saturn was razor sharp with excellent contrast! Remarkably flat field in the F/5 Newtonian as well, and it was easily the crowd favorite on Andromeda! This 9mm is my new workhorse! A rockstar in its price range! SUPER eyepiece for $45. Beat out others costing over $125 in side by side comparisons. A "sleeper" series. Not Televue but not $150 and a lot more. Highly recommended. I've always heard nice things about this eyepiece and picked this up last year but haven't gone observing until the other night when both the Moon and clouds cooperated. Using it in a 14 inch f/4.7 reflector I was pretty impressed. Granted I did not use it all that much but it gave sharp views across much of the field and nice views on Globular Clusters(M3 and M92), a nice view on M82 and finally Jupiter. Next time out I hope to do more of an evaluation, but a real bargain. Review by Alanoodle of Long Island, NY. I recently bought a used telescope which included this eyepiece. I didn't intend to use it since I already have a 9mm TMB Planetary II which I always considered an excellent eyepiece. On comparison, the Agena EWA eyepiece gave a brighter image which showed more detail. There was a little brightening at the edge of the field but overall, the view was more pleasing than the view through an eyepiece that sells for twice as much. Review by RogM of Clymer,NY. I had chance to finally use this lens a few nights ago in my XT 8" Orion. Checked out Jupiter and could easily see the belts and moons in good detail. I would recommend this EP for the money. Review by Jeff in Orlando of Florida. For the price, this is a nice eyepiece. Did'nt work too good in my 5" scope but I'm sure with the extra light gathering power of the new 10" Dob I'm getting, this will give great views..
Review by Scanning4Comets of Canada. Very light, nice contrast was seen on Jupiter, great eye relief. I love this EP! Review by Zamboni Schwartz of Colorado. Good budget widefield eyepiece identical to the Orion expanse at a much lower cost. Only complaints are that the eyepiece rattled a bit upon receipt due to a loose retaining ring on the internal barlow element. Also, the barrel has setscrew undercuts which get hung up on compression rings. Good optical performance though. Great for compact DSOs and for use in my PST. Review by lark83 of Dixon, CA. It's a great value for the money. Easy to look through, wide angle view. And not too much money. For now on this is the model eyepiece I'm buying. Review by Abhat of Middeltown, MD. 5.0 Cheap high quality alternative. Bought this instead of Orion Expanse EPs which were $30 more. These are very high quality EPs and provide pleasing wide field views. There is some distortion at the edges but who looks at the edges. I always keep my Planets and DSOs in the center. I use this very heavily in my 8" DOB and ST-80 and so far so good. It works great on both DSOs and Planets. Review by Lango of Canberra, Australia. I have a Skywatcher Heritage 5" scope and bought this eyepiece to replace the 10mm EP that came with the scope. Worth every cent! Very sharp images and a nice wide FOV. Just took a look at Jupiter and was able to clearly discern the shadow of Ganymede on Jupiter, even though Jupiter was still low on the horizon. This EP is fantastic value for money and highly recommended (from a keen amateur beginner). Review by Ron from NY of Ossining, New York. Great eyepiece that has enhanced my viewing experience. Great wide angle eyepiece. For low budgets this line is essential for wide field viewing. Review by Caleyco of Cedar Rapids, IA. I just recently got into amateur astronomy with an Orion XT6 Skyquest dobsonian and I needed a decent 9mm eyepiece that wouldn't break the bank. The wide angle view on this eyepiece is very accommodating for a noob like myself and I love the close, yet clear views I now have of the moon and planets. Can't wait to start searching for some deep space stuff with this sucker! Review by Ray J of WI. Review by Murry Pranksta of Akron, Ohio. A great lense for the price. I have had mine for about 2 months and it has become one of my favorite eyepieces. I use it in a 8"/F6 dob and my 80mm/f5 refractor. Some minor ghosting when viewing the full moon, but otherwise a quality piece at a great price. My next one will be the 6mm. Review by SBrand of New Hampshire. I use this 9mm eyepiece in a 1200mm Dob (F/6). This cheap eyepiece does suprisingly well on deep sky objects. The outer 20% of the field is a bit soft, but the central 80% is nice and sharp. The 66 degree AFOV means that I don't have to nudge my scope too often to keep objects in view. The biggest bonus for me was that it has enough eye-relief to use with my glasses on. On the moon this eyepiece did not do well by itself. I could not get a good look at the moon eventhough it was centered in the field of view. The internal reflections were just everywhere. With a moon filter this problem disappeared, but this is the reason I could not give it 5 stars. Review by FRANKB of Parma Heights, Ohio. 5.0 Quality Eyepiece, Great Price! This eyepiece is very good quality for low price,same as Orion Expanse. Highly recommend doing business with these guys. Review by Jon of SLC, UT. Just like my review for the 15mm, this 9mm is exceptional and brought all the AWWWW and WOW factor I could have immagined by a factor of 2.5(910/9)=252.78!!! I only have a 114mm Newt, with a R&P focuser so at that magnification it gets tricky to focus it just right, which isn't a fault of the lens.... BUT WOW. It's very cool and a huge teaser really, to see Jupiter that well. Makes me hungry for a larger aperture telescope. Review by duke of Charleston, WV. Quality lens at an affordable price. Agena Astro is a good company. Review by Steve of Pennsburg, PA. Tested in my C8 on Jupiter. View is clean to the edges and quite sharp. Bit of a "Wow" factor. Spent 3 nights with the C8 and brought out the GSR without a filter. Tested in my f/4.9 Dob. Gets a little blurry at the outer 15%. Jupiter was still very sharp in the center with only a outer moon showing slight coma. Nice view of M31 at 166x. It's a keeper! High quality eyepiece at a budget price. Review by Bill of Tucson. A well-coated, inexpensive Erfle, probably identical to the Expanse series. Outstanding WF eyepiece for deep sky if you have a long f/l scope. Not sharp at edge for f/5 or below. Review by Bill Gates of Tucson AZ. Appears to be identical to the "Expanse" line, but cheaper. Produces very dark fields due to relatively simple design (Erfle) and good coatings. HIghly recommended. Review by zanti-misfit of Enterprise, AL. 4.0 Good lens for the price of admission. I recently picked one of these up and its been worth every penny. Sharp views, nice fov, good eye relief, well made, and it won't break the bank. I've used this with my 8" Dob f/5.9. I'm pulling 133x mag out if this lens and it's a sight to behold. Barlowed in my 2" ED 2x up to 266x and it held up with clear views. It did get a little more challenging to get my eye in the right position to avoid blackout at that high mag. Performs a tad better than the EW 6mm in that regard. But you can't beat the price for these views. A great lens at a great price. 4.0 Affordable lens that works great! Great lens, affordable, well made. I recently picked one of these up and its been worth every penny. Sharp views, nice fov, good eye relief, well made, and it won't break the bank. I've used this with my 8" Dob f5.9. I'm pulling 133x mag out if this lens and it's a sight to behold. Barlowed in my 2" ED 2x up to 266x and it held up with clear views. It did get a little more challenging to get my eye in the right position to avoid blackout at that high mag. Performs a tad better than the EW 6mm in that regard. A great lens at a great price. I'm very satisfied with this lens and recommend it to all! Review by Zanti Misfit of Enterprise, AL. I purchased this lens to use with my 8" Dob f/5.9 and it's a winner! I really like this product. Well made, with clear and sharp views, just awesome. With my scope and the GSO 2" Barlow I'm getting 133x and 266x out of it, and they are both clear as can be. Enjoyed perfect views of Jupiter just now, with its stormy eye looking back at me. The FOV is nice and wide too, with good eye relief as well. I had no problems with this lens. Agena was a pleasure to do business with. Fast email response, great product! Review by Locoman of Kansas. I have a F/4.92 10" dobsonian and finding eyepieces that work well on a fast telescope that won't break the bank are hard find. I got the 9mm and it is superb on globular and open clusters. Looking at the moon with this eyepiece is spectacular. Saturn is well resolved too. It also barlows very well. The field of view is awesome. There is a little coma at the extreme outer edges but that is to be expected on my scope,I've seen a lot worse in other eyepieces. My 30mm wide field I got with my scope is what I use to find objects then the next eyepiece I use next is alway's the 9mm. I have no complaints with this eyepiece and would recommend it to anyone who has a fast scope. Review by Dave of Ausable Forks, NY. 5.0 Great Views on the Cheap. This is a great eyepiece for slower scopes f/5.9 and above. Slight ghosting on very bright objects such as the Moon and Jupiter. I also recommend the 6mm version of this eyepiece. Eye Lens Diameter 20.8mm / 0.82"